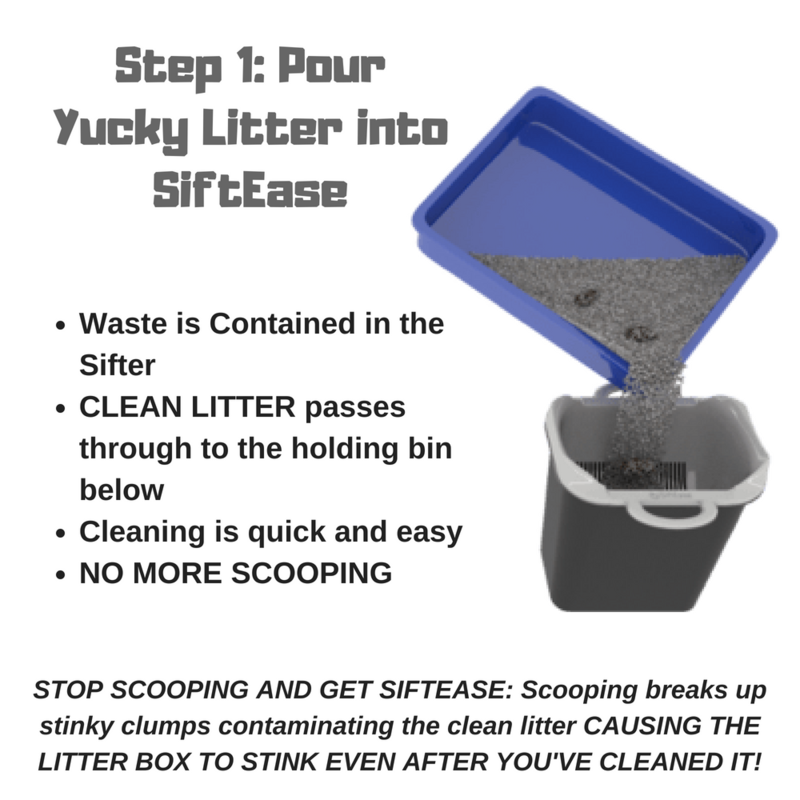 ★ Unlike scooping, pouring kitty litter through SiftEase prevents the stinky clumps from breaking apart and contaminating the rest of the clean litter, this eliminates the odors and lets you use that litter over and over again SAVING YOU TIME AND MONEY! At Clean Litter Club, we know your pets are your family and you want to take care of them. Keeping your cats litter box clean and odor free will make both of you happy! 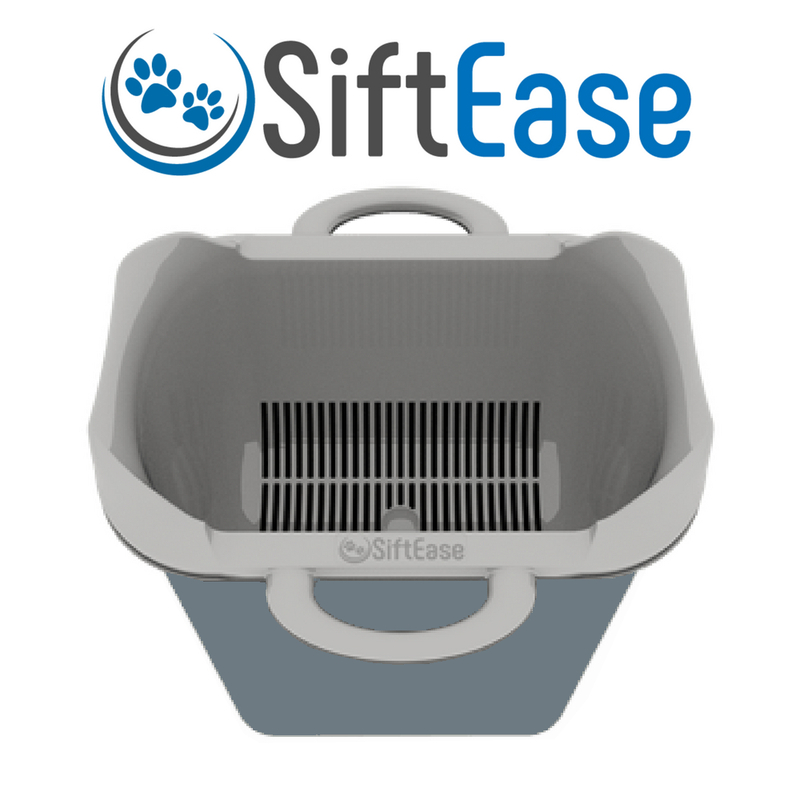 With SiftEase, cleaning the litter box is as easy as pouring the dirty litter out and putting clean litter back in. You’ll be amazed at how fast and efficient this chore becomes. 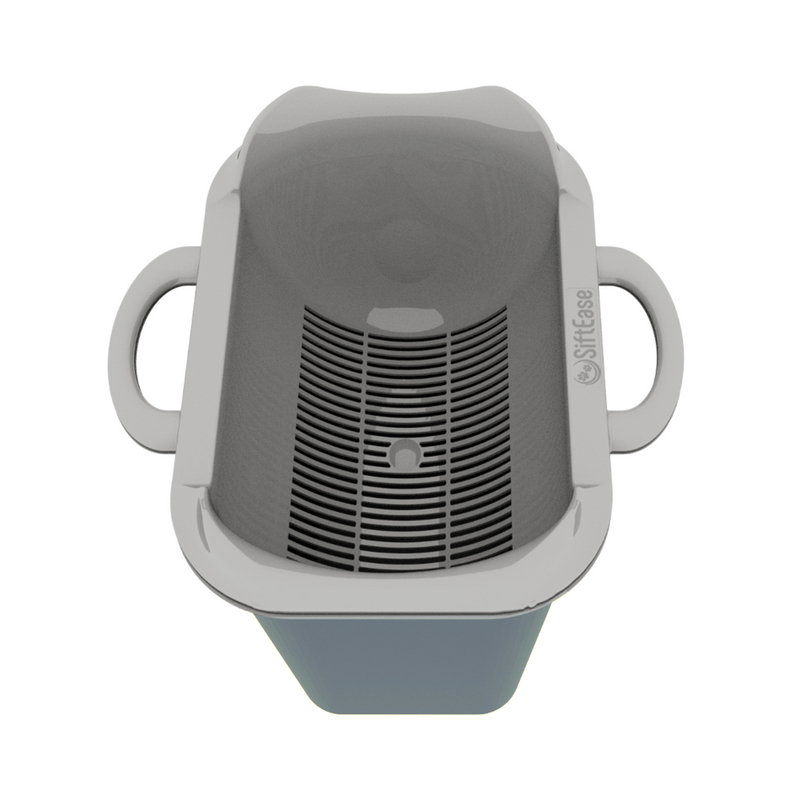 SiftEase works with any litter box that can be lifted and poured out and with any litter that fits through a scoop. Most cat owners are like us and have given up on the automatic and sifting litter boxes because they don’t work! Litter goo gets stuck on leaving a complicated mess. GROSS! Give your cat a litter box that they’ll love by simply cleaning it every other day with SiftEase. The chore will be easy and the odors will be gone for good. No more scooping, rolling, or taking apart a complicated litter box to clean it. WHAT ARE YOU WAITING FOR? 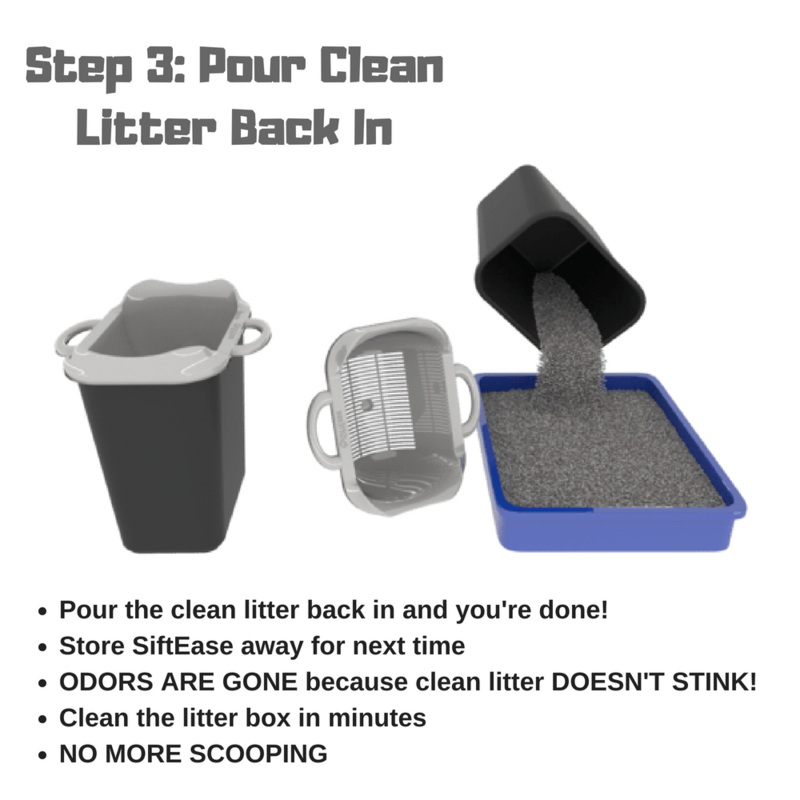 STOP SCOOPING AND GET SIFTING FOR A CLEAN AND ODOR FREE LITTER BOX TODAY! ELIMINATE LITTER BOX ODOR – Does the litter box stink even after you’ve cleaned it? This is because using a cat litter scoop to clean the litter box breaks up the stinky clumps and contaminates the clean litter. Sifting litter boxes don’t work either because the clumps clog up the slots and make for a complicated stinky mess! 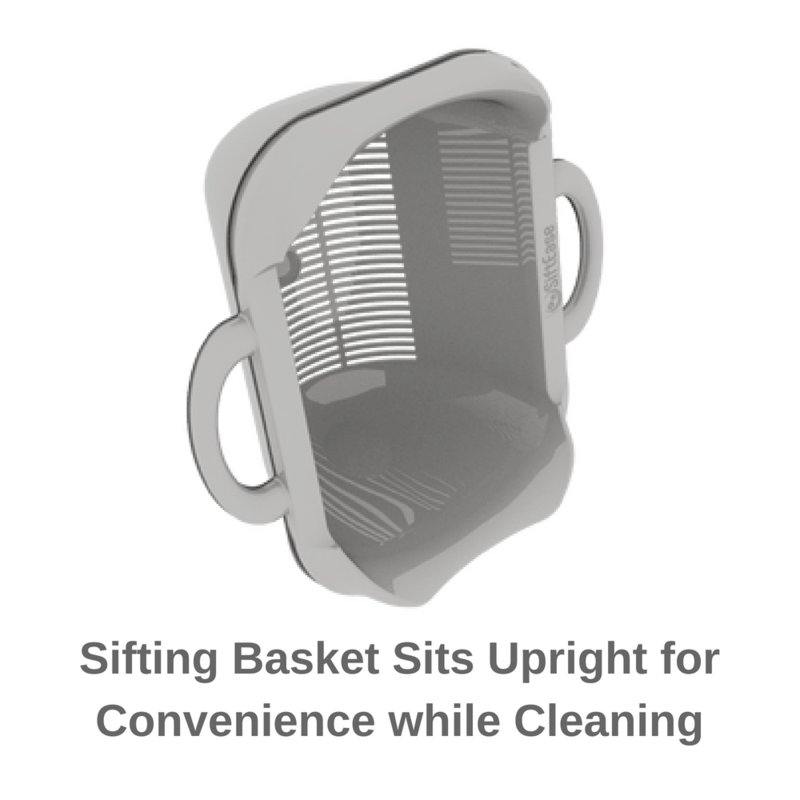 USE SIFTEASE TO CLEAN YOUR LITTER AND STINK NO MORE! HOW DOES IT WORK? SiftEase is the best litter box accessory you’ll ever buy! 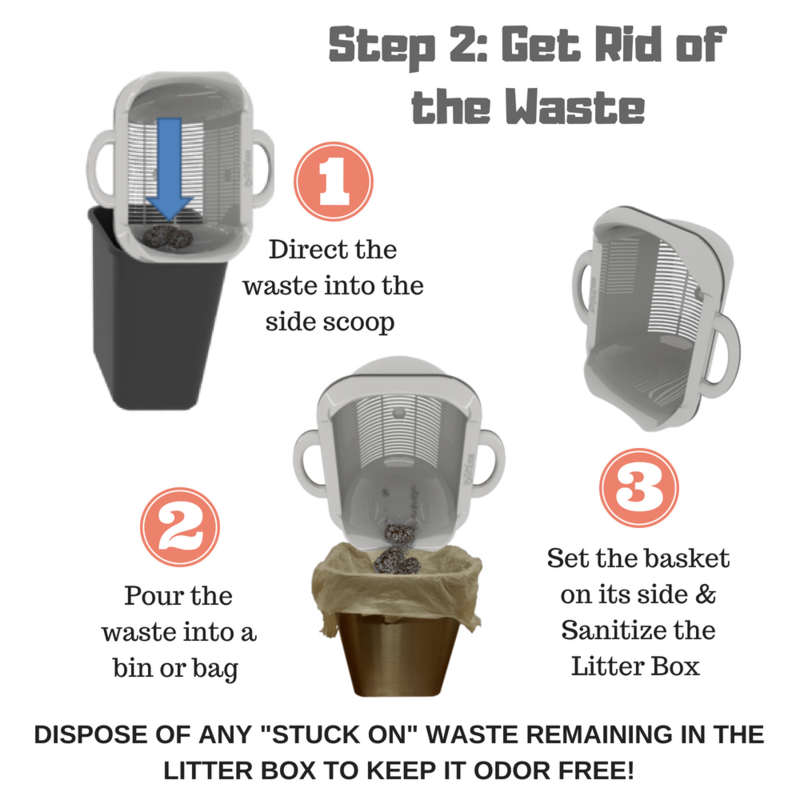 Simply pour the contents of the dirty litter box into SiftEase; waste stays in the upper sifting basket while clean litter passes through to the bin below. 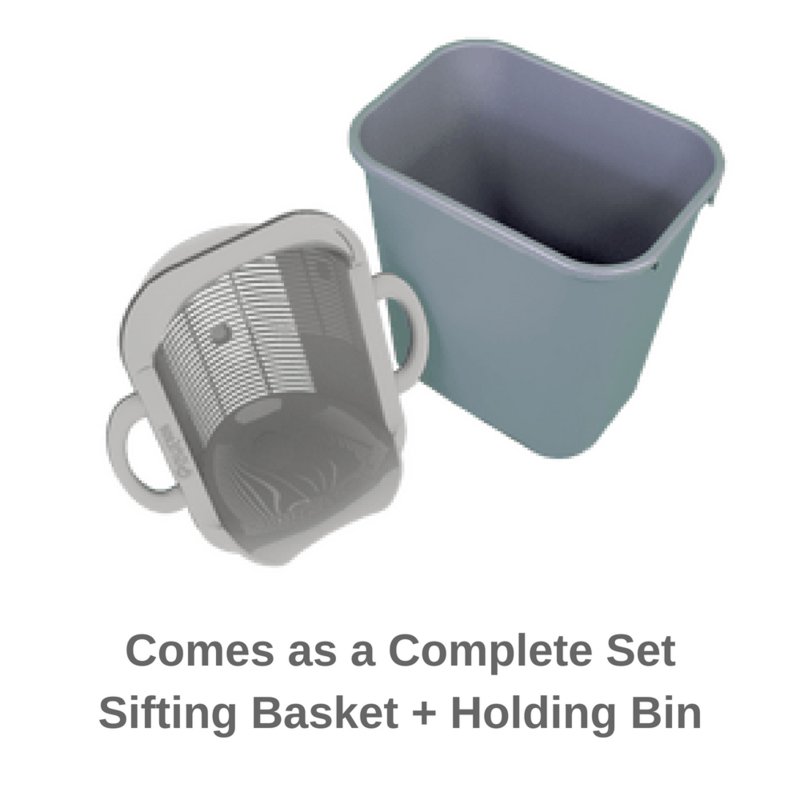 Then lift the basket and dispose of the waste all at once in a bin or waste bag and pour the clean litter back into the box. No more litter scatter mess or painful bending over to scoop! 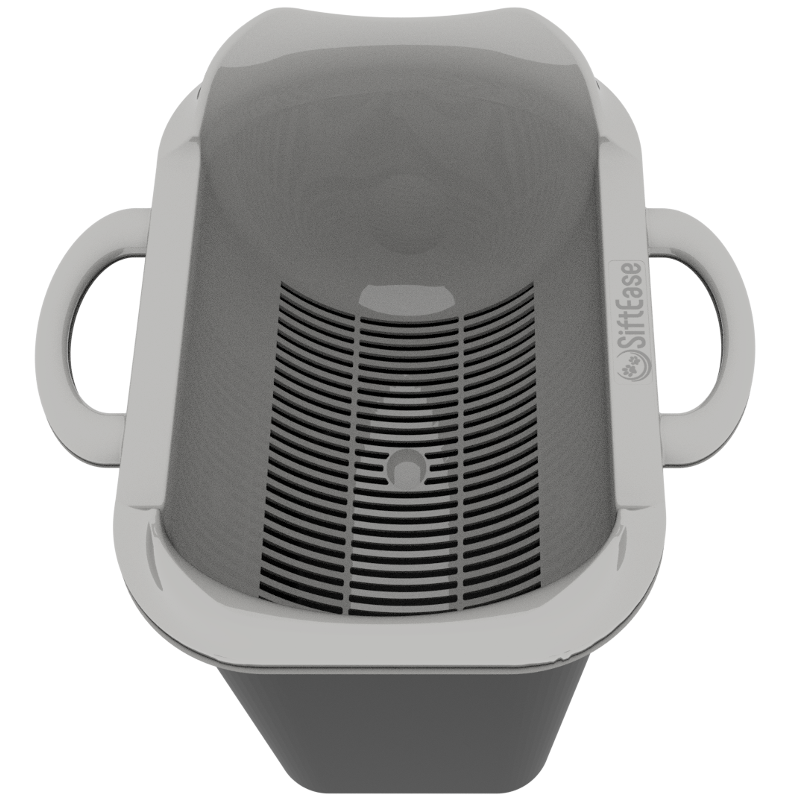 SAVE TIME AND MONEY – With SiftEase, you’ll save time because instead of scooping or sifting, cleaning the litter box is now as easy as pouring the nasty out and the clean litter back in. And because clean litter doesn’t stink, you’ll be able to use the same litter over and over saving you money. WHAT ARE YOU WAITING FOR? TRY SIFTEASE TODAY AND SAVE TIME, MONEY, MESS, and ODOR! KEEP KITTY HAPPY AND HEALTHY – We know you don’t like cleaning the litter box, but imagine how your cat feels when entering the scary temple of doom that hasn’t been cleaned in awhile. 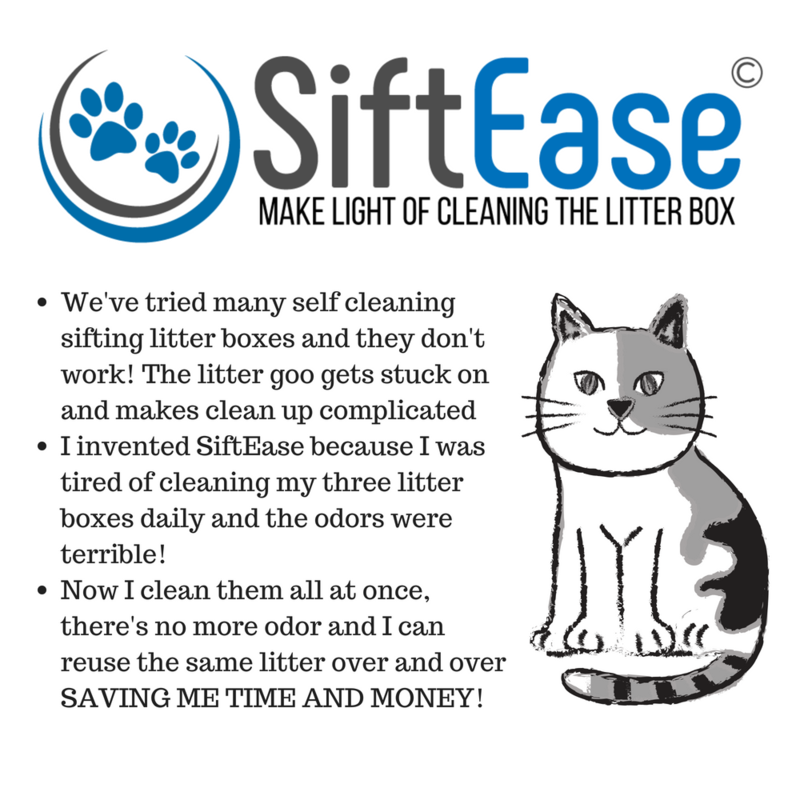 Clean litter keeps helps with behavioral problems of the cat skipping the box and you’ll love how easy this chore is with SiftEase. Most of all, you and your cat will notice after using SiftEase that the litter box doesn’t stink anymore! Odor free makes everyone happy! f 5 starsGreat tool for a not so great chore! – Phenomenal. I am the WORST at cleaning litter boxes. Actually, the rest of my family is since I’m the one that does it. We are known to go weeks – until my nose can’t take it any longer. I hate bending over to scoop and end up just tossing all the litter; assuming I can get most/all in the garbage bag. Then I’ll vacuum all of the litter on the floor. With Siftease, I was able to clean 2 litter boxes, including the litter I swept up off the floor and refilled both litter boxes within 5 minutes. The only issue I had was there were too many clumps for the good litter to sift down to the can. That was MY fault. Now I won’t wait so long and it will go much quicker and cleaner! Great gift! I have gifted this to a friend who has a beautiful cat on her birthday! Few days ago, she texted me how helpful my gift was to her! She said, she doesn’t have to bend down scooping and cleaning the litter box as she used to. It made cleaning easier for her. Frankly, her apartment smells better too when I visited her :-). Saved from back Pain! This device has been nothing short of a miracle. Gone are my days of having to choose between back pain from bent over scooping or wasting a bunch of litter from dumping it all at once. Quick and easy to use, 5 stars! Game Changer – This product is genius! I can clean two litter boxes in 3 minutes or less. It is such a timesaver for me because I have to empty boxes 1-2 times a day since I have one cat will not cover at all. Unfortunately, his bad habit stemmed from the anxiety that an automatic box caused when it started while he was sniffing around. This saves money and my cats are so much happier! Cleaning your litter box just became easy. This litter box helper is amazing. I was able to literally clean my litter box in one minute. I am always looking for ways to save time and “work smarter, not harder” and this litter box helper does that. One of the things I was most impressed with is that after I had cleaned the litter box I did not smell like the litter box. Thank you so much for making a super busy person’s life that much easier. This product is awesome and worth every penny: five stars does not do it justice.